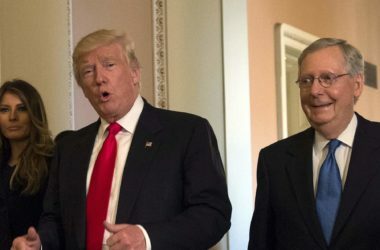 On Monday, we learned that Trump summoned not just the Senate leadership from both parties to the White House but, indeed, the entire Senate. It's unclear how the president will accommodate 100 senators on Wednesday, but that's the news. And it's definitely about North Korea. The briefing will be held by Rex Tillerson, "Mad Dog" Mattis, Chairman of the Joint Chiefs of Staff Gen. Joseph Dunford and Dan Coats, Director of National Intelligence. If you're wondering if this is normal, the answer is no. It's quite rare for the White House to brief the entire U.S. Senate, other than during a joint address to Congress. The announcement of the meeting was preceded by Trump speaking with both President Xi of Chine and Prime Minister Abe of Japan. Sounds like someone's getting ready for an attack. Trump also met with the 15 members of the UN Security Council on Monday. Yes, another unusual move. The intent was to push for harder sanctions against North Korea, but the full extent of what was said during the meeting is unknown. Nikki Haley, Trump's ambassador to the United Nations, issued a warning to North Korea on "Good Morning, America" on Monday, telling Kim Jong Un, "We don't want war, so don't start one." Meanwhile, preparations for a nuclear test are apparently taking place in North Korea, while the "armada" Trump lied about last week is finally -- we think -- headed back north toward the Korean peninsula. Oh, and North Korea detained a third American citizen over the weekend. I'm trying to stay positive about this; Trump is, as we know, mostly hot air. But, of course, he's been losing just about everywhere else and he seems to be able to drop bombs without even telling Congress, so a war may just be what he needs to look decisive. There's a chance, though, that his summoning the Senate and the UN Security Council to the WH in the same week he's having dinner with the entire Supreme Court (which as far as I can tell hasn't happened since FDR) is him summoning powerful people to him just because it makes him feel good. "This is a real threat to the world, whether we want to talk about it or not," Trump said Monday at a lunch for ambassadors of countries who sit on the Security Council. "North Korea's a big world problem, and it's a problem we have to finally solve. People put blindfolds on for decades and now it's time to solve the problem." Trump's comments come as the USS Michigan, one of US's most powerful submarines, arrived in South Korea in an apparent show of US force and senators have also been summoned to the White House to be briefed Wednesday by top officials about the threat posed by North Korea. 65 percent of Americans are very concerned about North Korea having nuclear weapons. A similar proportion, 64 percent, say that in the event of a serious conflict, the United States should use military force to defend its Asian allies, such as Japan, South Korea, or the Philippines, against the Pyongyang regime. A further 61 percent think economic sanctions, rather than attempts at closer ties, are the best way to deal with the nuclear threat posed by the Democratic People’s Republic of Korea. While Republicans and Democrats are closely aligned in their negative views of North Korea, they differ in their assessment of the threat posed by North Korea and how to respond. Nearly 75 percent of Republicans are very concerned about the country having nuclear weapons, compared with 66 percent of Democrats. A majority of Republicans, at 70 percent, are keener on sanctions than Democrats, at 61 percent. On the question of defending U.S. allies in Asia in the event of an attack by North Korea, 70 percent of Republicans, compared with 61 percent of Democrats, favor responding with military force. Last week's news that U.S. spy satellites have spotted trucks taking North Korea's stockpile of nuclear fuel rods out of storage may add to American concerns about the growing threat of North Korea's weapons programs. In response to a recent Gallup Poll, 14% of Americans described North Korea's military and weapons capabilities as a "crisis for the United States," and an additional 60% said it was a "major problem." A year ago, President Bush drew many Americans' attention to North Korea's oppressive regime in his State of the Union address, when he included it with Iraq and Iran in his "axis of evil." In response to a poll shortly thereafter, 54% of Americans said they would describe the North Korean government as "evil," putting it lower on the list than the Iraqi government (82%) and the Iranian government (69%), but higher than those of Cuba (45%) and China (38%). And a majority of Americans (65%) had an unfavorable view of North Korea, while fewer than one in four had a favorable view, according to a February 2002 Gallup Poll. When Americans were first asked, in August 1950, if deciding to defend South Korea was a mistake, only 20% thought it was, while 65% said it was not a mistake. But by the following January, opinion had shifted dramatically, and 49% thought the decision was a mistake, while 38% said it was not, and 13% had no opinion. In the next several months, as Gallup asked the public if "going into war in Korea" was a mistake, opinion remained relatively stable, with more Americans saying it was than saying it was not. Six months later, as truce talks were being conducted at Kaesong, Americans were feeling more positive -- 42% felt the war was a mistake, while 47% said it wasn't. But the numbers shifted again six months later in February 1952, when a majority said the war was a mistake for the United States, soon after a POW exchange proposal by the United Nations was rejected, and riots in the United Nations' overcrowded Koje-do prison camp resulted in the deaths of many North Korean prisoners. By January 1953, soon after Eisenhower was elected and truce talks began again, the American opinion shifted yet again, with half of Americans saying the war was not a mistake, while a low of 36% said it was a mistake. My guess is that if there is real public support for war with North Korea, it's soft. Americans probably don't remember how difficult the first one was, but compared to our constant involvement in the Middle East, not enough has happened vis-à-vis North Korea to harden U.S. opinion on it. Additionally, I don't think Congress has expressed nearly the kind of vitriol against NK as it did against Iraq in the early 2000s. So if Trump thinks that war with North Korea might bolster his ratings, he'll probably find that the country isn't with him for long.